The concept was first described in 1865 by French physiologist Claude Bernard and the term “homeostasis” was coined by Walter Bradford Cannon in 1926. The ECS (endocannabinoid system) operates via a network of cannabinoid receptors, they are imaginatively named CB1 and CB2. CB1 receptors are primarily located in the brain and central nervous system, it is the ‘activation’ of the CB1 receptor by THC that is responsible for many of the therapeutic effects of THC, it is also the mechanism responsible for the psychoactive effects, or high. There is a lack of CB1 receptors in the part of the brain that regulates heart rate and respiration, therefore (unlike opiate analgesics) THC does not have a lethal dose, a person can consume as much as they require to achieve a beneficial effect. 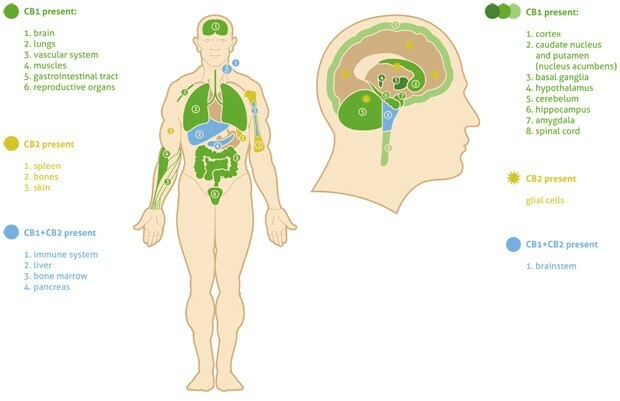 CB2 receptors are primarily found in the immune system with the highest concentration located in the spleen. 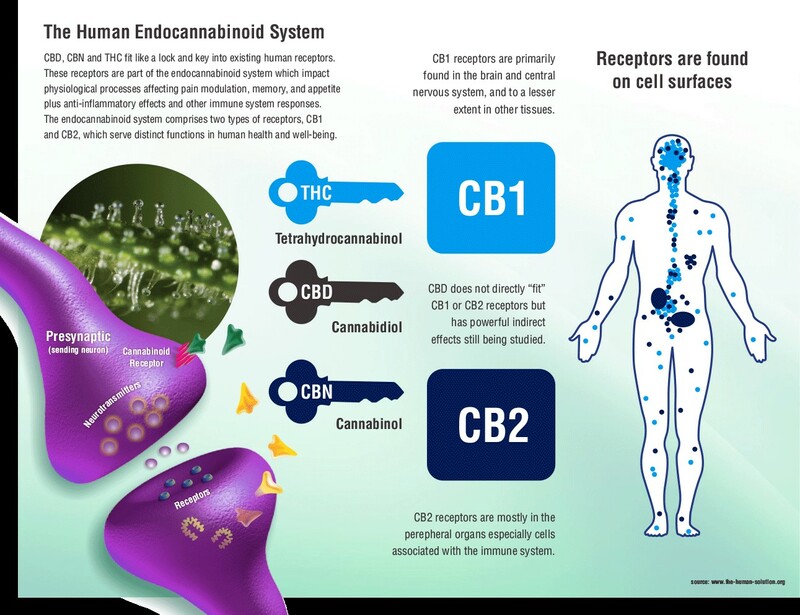 CB2 receptors are ‘activated’ by the cannabinoid CBD which is a very effective anti-inflammatory agent, another benefit of CBD is that it moderates the psychoactivity of THC. As well as THC and CBD, the cannabis plant produces in the region of 80 cannabinoids, e.g. CBG, CBC and CBN, they all have medicinal properties. Dr Ethan Russo proposes that migraine, fibromyalgia, irritable bowel syndrome, and related conditions represent ‘‘clinical endocannabinoid deficiency syndromes’’ (CEDS). It has been speculated that a dysfunctional endocannabinoid system in infants contributes to ‘‘failure to thrive’’ syndrome. In human studies, endocannabinoid system deficiencies have been implicated in schizophrenia, migraine, MS, Huntington’s disease, Parkinson’s and irritable bowel syndrome. Dr Russo’s assertion that a dysfunctional endocannabinoid system in infants contributes to ‘‘failure to thrive’’ syndrome is supported by the work of Dr Melanie Dreher. According to the latest findings, cannabinoids occur naturally in human breast milk. The human body contains cannabinoid receptors that are specifically designed to process endo-cannabinoids such as anandamide. Many cell membranes in the body are naturally equipped with cannabinoid receptors which, when activated by cannabinoids and various other nutritive substances, protect cells against viruses, harmful bacteria, cancer, and other malignancies. Human breast milk is an abundant source of endocannabinoids, a specific type of neuromodulator lipid that basically teaches a new-born child how to eat by stimulating the suckling process. Dr Melanie Dreher studied women using cannabis during their entire pregnancy, and then studied the babies one year after birth. She found that babies of the women who had smoked cannabis daily during their pregnancy socialized more quickly, made eye contact more quickly and were easier to engage. If it were not for these cannabinoids in breast milk, new-born children would not know how to eat, nor would they necessarily have the desire to eat, which could result in severe malnourishment and even death. New-born children who are breast-fed naturally receive doses of endo-cannabinoids that trigger hunger and promote growth and development. Observations of how babies acts after being fed show they exhibit symptoms of cannabinoid use. As well as the essential function of stimulating an infant’s appetite, cannabinoids also help to calm and relax the baby. Cannabinoids are not, however, present in baby formula, which makes it far more inferior to breast milk. This essentially means that the human body requires and produces cannabinoids, as these nutritive substances play a critical role in protecting cells against disease, boosting immune function, protecting the brain and nervous system, and relieving pain and disease-causing inflammation. In a separate study on the endocannabinoids published in the journal Pharmacological Reviews in 2006, researchers from the Laboratory of Physiologic Studies at the National Institute on Alcohol Abuse and Alcoholism uncovered even more about the benefits of cannabinoids. These include their ability to promote proper energy metabolism and appetite regulation, treat metabolic disorders, treat multiple sclerosis, and prevent neurodegeneration, among many other conditions. Cannabinoids, whether naturally produced in the body, or ingested from the cannabis plant itself play a vital function in strengthening the immune system and combatting many cancers and disease. As we have learned, the ECS is vital to the well-functioning of the human body and as with all systems in the human body it requires nourishing in order to function effectively. Cannabinoids have an anti-cancer effect which is expressed via CB1 and CB2 receptors, not all healthy cells have a cannabinoid receptor, however as part of the mutation process a healthy cell turning cancerous will develop cannabinoid receptors. This very interesting paper gives some good insights into the endocannabinoid system and cancer. Studies at Madrid Complutense University have shown that the anti-cancer mechanism of action of THC is caused by the activation of the CB1 receptor in cancerous cells, this creates a build-up of ceramide within the cancerous cell which in turn can lead to programmed cell death. However, it is becoming apparent that some forms of cancer respond differently to cannabinoids or indeed a combination of cannabinoids, e.g. in gliomas (brain cancers) a combination of THC and CBD seems to be more effective than either THC or CBD alone. As both THC and CBD have anti-cancer properties at Bud Buddies we believe both cannabinoids are important in treating cancer. There are many forms of breast cancer and research indicates that some forms respond very positively to CBD therapy, e.g. estrogen driven. See our section on breast cancer for more information.